When you lose your job, you feel crushed. And if you don’t find a new job quickly, the idea that your plight is anything short of a life disaster may seem even more ridiculous. Losing a job, and especially with the prospect of being out of work for an extended time period, wrecks your pocketbook and your sense of self-worth. In short, losing your job is one of the worst experiences of your life. I agree. Yet what I believe has really happened to you is that you have been set free. Free from going tomorrow to a job where you wonder if you’ll be there another day or a month. Free from the headaches of a project, chasing new jobs for the firm’s marketing efforts, and fearing disturbing discussions behind-closed-doors. Your time is now your own. And that is quite a gift. Furthermore, your freedom comes at a time when the architecture profession is battered from all sides. In short, trends and society have not favored architects. We all know that. In the worst economic decline since the Great Depression, architects are the most out-of-work profession in America. A small field of only a couple of hundred thousand people at best, 50,000 are out of work. (New York Times). Some locations are facing over 40% unemployment. It’s bleak. But that’s not my focus. I want to talk about freedom and what you might do with it. Think of it as money in the bank. You can withdraw from it every day. I wager that the better you spend it, the more freedom you will find. In other words, invest in yourself wisely, generously, enthusiastically. You have struck gold. While I don’t know how bad things are for you, I know that there is life beyond your old job. And it’s not that the firm didn’t value you. It’s that they are thinking only about money. Letting someone go means that they could not write any more checks to you. I know it sounds strange, but as much as you might have loved that job, you can learn to love your new situation more. And you can actually do more of what you set out to do as an architect. I’m going to share some ideas of how you might spend your time – 101 ideas but who’s counting! Some may seem ridiculous, others obvious, and still others might resonate with your current needs. Because you might be feeling shock or operating in survival mode, desperate for both cash and confidence. Now that you have tomorrow off, your time is your own. Think about that. You have tomorrow free to do what you want perhaps for the first time in years or even decades. Because tomorrow was reserved for work, and that’s not happening. So what will you do instead? I have a few ideas in no particular order, just to get you started. 1. Take a walk. Walt Whitman credits his creativity with his daily walks around Walden Pond. It’s one of the most peaceful things you can do. Walk in nature, or walk down a treed street. If it’s cold or rainy, just dress for it. 2. Plant something green. In a pot, in the ground. It will grow as you grow. 3. Go see a movie, especially one that you would never go see. 4. Go to the highest point in the city and look around. What do you see? What would you do to make it better, fix the ills? If you were dreaming, that is. What do you think will be there in 2020 or 2030? Use your knowledge of architecture to stretch your images of the city. 5. What is your favorite architecture in your city? Go visit it. Think about why it’s special. Start recognizing the unique attributes of your place, inventory, and analyze its quality so that you become an expert. 6. Photograph your house, your street or neighborhood. Or one that you particularly love or hate. Find places that draw or repel you. 7. Go to the library. It’s a world of ideas. See what areas draw you. You are not limited to architecture in the library. For instance, I found great pleasure in children’s books about historic cultures. 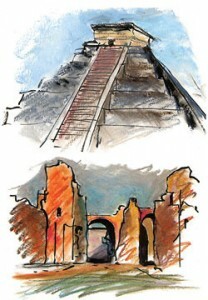 I imagine what kids think when they first encounter pyramids or cathedrals in books. 8. Work out. Every day. 9. Eat well. That means healthy, for wellness. You’ll feel better. 10. Meditate. Sit quietly at least 10 minutes with your eyes closed. 11. Breathe deeply. Regularly. Frequently. 12. Sing, whistle, dance or skip. Automatically uplifting, guaranteed. 13. Talk with friends and family. They are your support group. They care. 14. Go somewhere if you can afford to – you have the time. If not, go virtually. 15. Write down what you did in your architectural job. 16. Consider why you became an architect. What was different between what you dreamed and what you did? How can you aim at the original dream? Note, it might not even be in architecture; you have transportable skills if you break them into parts instead of just one idea: architect. 17. Think about times where you did incredible work, in school, at work, in volunteer activities. What was it? Design, drawing, talking with people, coordinating. Figuring out particularly tricky technical problems. Getting to work early. Working under pressure. Write all of it down. 18. What did you think an architect would do when you first contemplated being an architect, when you graduated, or when you started with the recent firm? How did it change and how did your attitude and enthusiasm change? 19. How did you spend your days? What was valued by the firm, what was ignored or even shunned? 20. Who had a job like you wanted? Think about what it was like. 21. What do you care about? Write it down. Draw it or gather some objects that represent your most important values. 22. If you were a developer, what would you build? 23. Think about your situation – why were you let go? From the day you began there – a rosy cheery moment I hope – to the last day, what was the trajectory? At some point, you fit and in the end, you did not. Leaving there really was a gift. Think about what changed – even beyond the loss of work. Are you pleased with their view of you – the types of jobs they gave you? Or were you just accepting it because it was a job? 24. Get licensed. Really. I know, Bill Gates didn’t’ graduate from college, but you did. And Orville Wright didn’t have a pilot’s license. (My good friend Gordon MacKenzie said that). If you are ready to reinvent the world as they did, then go do it. Excellent! Otherwise, chalk up these milestones; that’s all they are. Life is not better on the other side but it is a touchstone, no more “wish I had.” Live life with minimal regrets. 26. Learn to play the piano, paint, or speak a new language. 28. Find the Architects Twitter League and see who else is there. Follow them. http://bit.ly/bbSKqJ Or use my Architects list. 29. Get tweetdeck or hootsuite and start making groups of people you enjoy. 30. Search some terms on twitter and see what crops up. I search architecture, cities, and LEED at all times and add temporary searches at other times. 31. Find people in those places you want to visit. See what they think of the pyramids or the Burj Khalifa. 32. Sign up to Facebook and find your friends and family, your local AIA, other groups that interest you. You don’t have to answer all those questions, just the ones you’re comfortable with. 33. Post some photos on Flickr or slideshows on Slideshare or book reviews on Goodreads. 34. Sign onto Linked In and Plaxo and find the architectural networks. 36. Learn to cook something new. 37. Invite friends over to play games. Or for coffee or beers. 38. Go bowling. Or ice skating. Or roller skating. Alone. In other words, get lost and do something you never do. 39. Offer to read or teach at the local elementary school or library. 40. Serve meals at a soup kitchen or deliver them to shut-ins. 42. Pull out your old projects and figure out what you did well. 43. Invent how your projects would be different if you were deciding. Who would be on your dream team? who wouldn’t? 44. Sell some stuff. Use Ebay, Craigs List, have a garage sale, set up a booth at the mall or market, or list it in the paper. 45. Be frugal. Stretch your resources so that you can choose your destiny. 46. Offer to mow your neighbors grass or fix a fence. 47. You just reduced your carbon footprint significantly by eliminating the commute. What else could you do? Many web sites can help you. 48. Go to planning commission meetings. Or sit through a court case or a city council meeting. Improve your understanding of how government works. 49. Assess the sustainability of your house, your neighborhood, or your city. How does it compare to similar places, or to model places? what can you do to improve it? 50. Write a white paper on what your neighborhood or city could do to be more sustainable. Strive to give back energy to the grid. That’s the goal, be a producer. 51. Check out on-line city lists for quality of life, and “best of” lists. Forbes has many of these. How does your city rank? What area are most important? How can you help your city be unique? 52. Write an op ed to the paper – and then do it every month or quarter. 54. Be a guest columnist. 55. Speak to the Rotary, Chamber, Lions or Lioness Clubs, the Y, and so on. 59. Start a blog (you knew I’d get here, yes?) Start with Posterous if you want something easy. 60. Make comments on others blogs. There are so many great architecture blogs. 61. Draw a tree. Or a person. For architects, those are the hardest, yes? Buildings are easy. 62. Start a cartoon strip. Find humor. 63. Write a novel. Create fantasy, use your imagination. 64. Research something you wondered about and never had the time to check. 66. Think about your city in 2050. How many people? Where will they live? 67. What will climate change do to your city? Drought, Storm events. Hurricanes. Flooding. How prepared is the community? 69. Inventory unused spaces. What could be done with them? Invent possible projects. 70. Do a Kevin Lynch style survey of the area. Get others to do it too. Landmarks, barriers, pathways, etc. How do others see your district? 71. Keep track of favorite architecture or places you want to see in the city or around the world. Make a wishing map. 72. Make a google map of your favorite places in your town. I can’t tell you what time I’ve spent figuring out what to see in a strange city. And then get home to find out they just built some incredible new school or bridge. Horrible. Why don’t we have good architecture maps with insider tips? 73. Make a video. Post it on your blog. 75. Make your goals. Tie them to your daily activities. 76. Volunteer for AIA activities. Or the organization of your choice. Go where you can leverage your expertise and meet people that want to work with you. 77. Start a new group with your friends. Agree to meet or fix dinner once a week or once a month. 78. Write your obituary. I’m not being morbid. Knowing that we are mortal – foreknowledge of death – is a uniquely human trait, quite remarkable. It’s the ultimate limitation and sharpens purpose, meaning in life. Because we die, we must use our time wisely. So hone your writing skills. Say you die in 10 years, what is your obit? Or 20, 30, 40, 50 years? Think about the world at that time. What would you want to contribute? A building or park? A new way of seeing things? A mourning family? A book, a house, or a garden? 79. Plant a garden. Harvest your own food. 80. Sell some of your produce – sketches, pumpkins, painting, stories, what? 81. If you had today to create something, what would it be? What do your neighbors need? What did your clients need? Or co-workers, or consultants, or suppliers, or contractors? 82. What are your skills? Say, technical, illustration, problem solving, synthesizing, research, design, storytelling, BIM, construction, whatever it is. Itemize it outside of the architecture profession and think who could use it? How could you use it online, developing your own brand? Fantasize about that. And then try it out. 83. Join the local social media club, find out what they are doing. Because augmented reality is up and coming. 84. Go help in Haiti, or in New Orleans, or somewhere else that is in need of architects. Don’t stay where cities are dying, unless you just love that challenge. 85. Become a member of a volunteer board, something you care about or that is in sync with your larger goals. 86. Develop deep ecological knowledge of your neighborhood and city – look back at least 12,000 years (the time of civilization and cities more or less). Think about the streams, geology, weather patterns, flora, and fauna. What has changed? 87. Take classes towards your larger interests outside the architecture field. For me, that was futures/forecasting, and communications since I felt architects were not particularly apt at verbal expression. What’s your area? Science, business, education, social science, health care? Everything links with architecture. You are making yourself more uniquely valuable..
88. Develop cultural history of your hometown and think about how the architecture unique reflects the culture and ecology of your region. 89. Look at regional cooperation and projections. How many people will be in your city in twenty years? In Kansas City, a city of 2,000,000 people – which is just about average among global cities – another 500,000 are expected to be here by 2030, according to Mid-America Regional Council. But the cities of the metro area each want those people, and are collectively planning for 5.2 million people! It’s useless infrastructure and wasteful competition. What is happening in your city, and can you make it be more reasonable? You are an architect and come with expertise. Use it. 90. Use the design process to solve other problems. – assess, research, develop alternatives, select, develop, implement. Charrette workshops, synthesizing, creativity, are all intriguing and central to business innovation. Few fields focus on creativity, while we are well versed in it. Yet, with automation, anything that can be prototyped, will be. We know something of great future value – design thinking. http://bit.ly/4kEsLn How can you use it? 91. Develop your perspective on topics that matter to you. Write, research, and talk about them. Try http://architecture.alltop.com/ for starters. 92. Think how you can be involved in clean technology. Rather than limiting yourself to design and construction, imagine how people use cities, how behavior can be different. 94. Limit your activities to things that develop your life, improve your city, or contribute to big ideas, like the future of the profession or quality of life. 95. Imagine the impact of climate change on your city. How well is it prepared for flooding, drought, weather events, and so on? 96. Outline a manifesto of your ethics – the future of… your family, your profession, your city. What is important to you? What is your vision and what would you change? 97. What in your life feeds you and drains you? Does something strengthen your network, expand your knowledge, or contribute meaningfully to quality of life? If not, let it go. 98. Analyze your city’s choices: what is important based on decisions? 99. Where is the affordable housing or the blighted areas? 100. Is there any chance those disenfranchised areas will be in better or worse shape in 10 years? What can you do about it? 101. Think how closely your dreams, your vision of the future, matches or disagrees with your current situation. Then go make that future image happen. A failure of imagination holds us back so often. You have enormous resources – your knowledge, assets, network, experiences, and most of all, your vision of the future. For perhaps the first time, you have the ability to do something about your dreams because you have the time. Cut back expenses, become ultra-sustainable, be where things are happening. And be ready with your unique point of view. Prepare yourself to contribute. We are living at a time where architecture as it is traditionally defined bucks the trends. It’s in decline. No doubt about it. Even with the extra 3 billion people expected to live in cities during the next 40 years, they are not knocking on the American architects doors. They are figuring out how to do things themselves, using local resources and people. You should do the same! Make yourself useful in the new world. Because sustainable, living cities, social networks, and automation are the perfect storm for changing how we build cities. When there is change, there are new opportunities. Be ready, alert, and learn the new freedoms offered by online social networks and research knowledge. During the greatest urbanization of all time, you have the freedom to shape a new world, starting today. I had lunch with two of my favorite architects a couple of days ago, women with whom I worked for a dozen years and have known for close to two decades. They are both recently unemployed. Dear Friends, I hope you read this and understand that free time and deep commitment to a special cause is far more valuable than working at a place that has other things on its mind than your life and development. You really have been given a gift. Best Wishes. I rarely drew beyond diagrams while I was completing my doctorate last year. This spring I took a sketching class just to remind myself and it was like going to a spa twice a week. We drew fast – 5-20 min drawings on large pads for 2 hours. I emerged refreshed, renewed. Our assignment was a sketch a day, 100 total. Like practicing piano scales. Steven Holl, architect, starts every day with an hour of sketching or painting to make sure he remains creative. Sometimes he has a project in mind, and other times not. http://www.arcspace.com/studio/s_holl/. If it’s important enough for a world-renowned architect to do in what must be an impossible schedule, why not me/you? It’s like breathing for your right brain. It’s not important to be beautiful or accurate, but to express with your hands and eyes. That’s all. Use those muscles, coordinate them, keep it simple. Very soft pencils, charcoals, felt tips are best on a not too finished paper like newsprint or sketch pads but any tools will do. Just draw your hand, coffee mug, or William Shakespeare’s face. Primitive sketching is as good as Glaser’s – the point is to draw, use your hands and eyes to see whole things. You can almost feel the right hemisphere light up. Drawing fires up the whole brain. Then you can go to work.